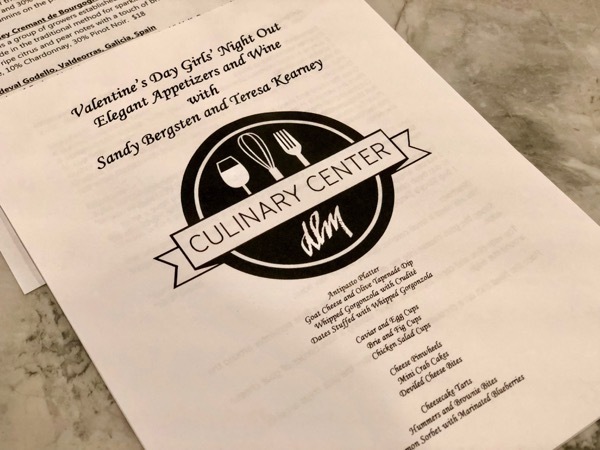 Right before Valentine’s Day I taught a Girls’ Night Out cooking class at Dorothy Lane Market’s Culinary Center. 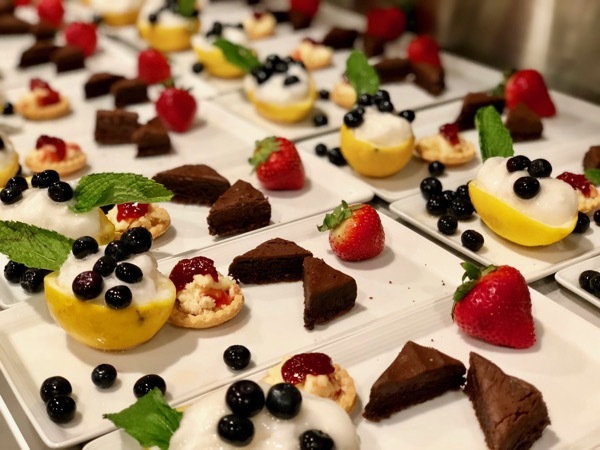 The evening featured elegant and effortless appetizers and some simple but spectacular deserts. To make it more fun, Teresa Kearney, paired it all with wines from across Europe. Because let’s be honest, when having people over who doesn’t want to know how to make a splash without a lot of fuss. Below you will find recipes that are embarrassingly easy. I find they are the perfect way to start and end any evening. Here’s a secret… take something basic such as a dip, crudité, or meat and cheese platter and upgrade the ingredients so it looks fresh and interesting. As our students sat down they were greeted with an antipasto platter. Forget the salami and cheddar. 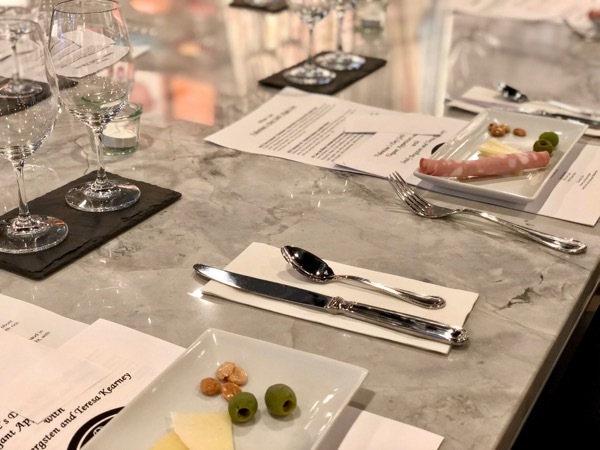 A platter of castelvetrano olives, roasted marcona almonds, slices of manchego, and rolls of paper-thin mortadella is so much more inviting with its array of textures and flavors. And while you are at the olive bar pick up some olive tapenade. It’s the perfect topper for a soft goat cheese. Add a decorative bowl of pita chips and you have a 30 second starter. Unless someone is on a killer diet no one even notices the veggies and dip. Here is a crazy good recipe for whipped gorgonzola. Pulsing a dolce (sweet) gorgonzola with a little cream cheese and heavy cream makes for an ethereal concoction. 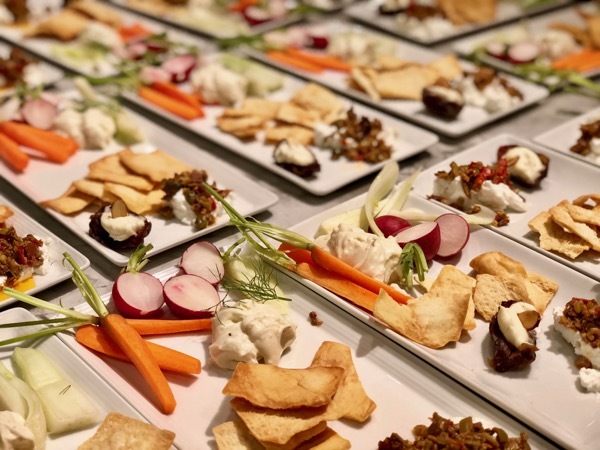 Get creative when you select your crudité. Swap out fennel for celery. Instead of pre-packaged carrots that look like whittled down nubs, pick up a bunch of thin young carrots with their leafy green tops. Quartered and halved radishes sport a new look when you leave their tops and tails on as well. And try making chips out of peeled and thinly sliced rainbow beets. The whipped gorgonzola is also incredible piped into half of a pitted date. I am smitten with these wafer-thin Siljan cups. You can put absolutely anything you want into them. And no matter how humble, whatever you put in is instantly elevated. For the first I made a little egg salad and added a dollop of Caviart. If you’ve never tried it, you’ll be amazed. It’s actually made out of seaweed but looks and tastes like caviar. You’ll find it in the canned seafood aisle. And the best part- the black never runs. For the second I put in a dollop of triple crème cheese and a smidge of fig jam. And for the third… don’t faint… I chopped deli-bought chicken salad, spooned it it and put a couple toasted almonds on top. No party is complete without a passed hot hors d'oeuvre. Here are three that couldn’t be easier to prepare. Cheese pinwheels freeze beautifully, making them the perfect go-to appetizer. The mini crab cakes are actually fresh crab cakes from your grocery’s seafood counter formed into small bite-sized disks, pressed lightly into panko, then quickly sautéed. They can be formed and refrigerated hours ahead of time. They can even be sautéed earlier then reheated in a warm oven. 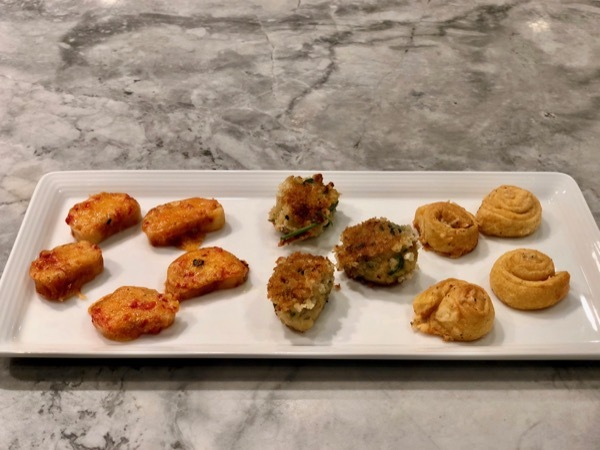 The deviled cheese bites are simply slices of bakery-fresh asiago breadsticks topped with deli-made pimento cheese dip, then broiled until hot and bubbly. No night is complete without a sweet. When you’re pressed for time these three will impress your guests, and again they couldn’t be easier to make. 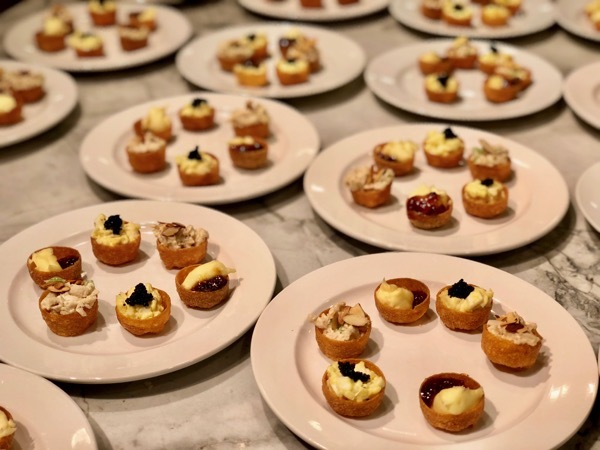 The cheesecake tarts are believe it or not disassembled bakery-fresh cheesecake slices reassembled into bite-sized shortbread cups. The lemon sorbet with blueberries is just a hollowed out fresh lemon half filled with purchased sorbet. The lemon cups can be assembled days ahead of time, wrapped in plastic wrap and stored in the freezer. When you are ready to serve unwrap and top with blueberries that have been tossed with a little grand marnier. The brownie bites are center cut frosted brownies from the bakery cut into little triangles. Changing the shape of the most mundane magically enhances it. 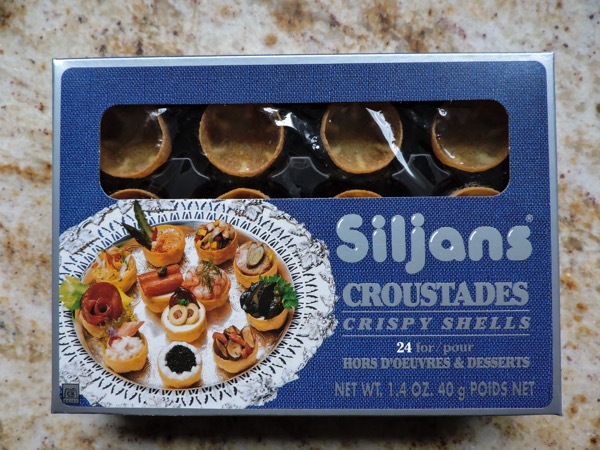 These little bites are perfect served on a platter with fresh strawberries and if you really want to wow your guests accompany them with small wine glasses filled with hummers. 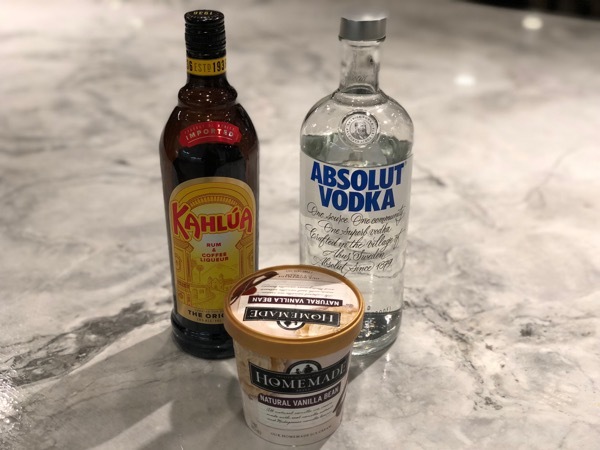 You can whip up a batch of these decadent after-dinner drinks made from vanilla ice cream, vodka and kalua and stow them in your freezer for up to a week ahead of time. 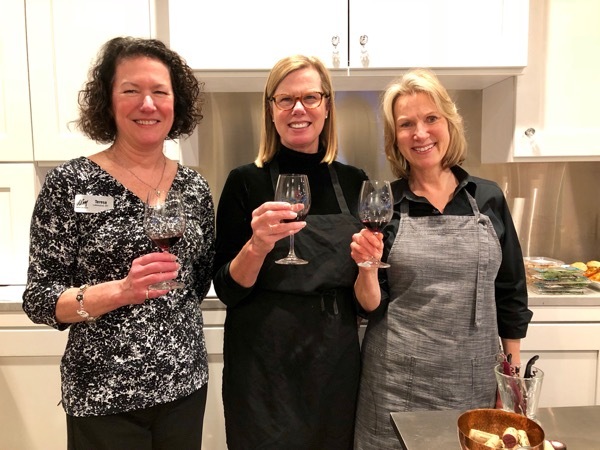 It’s always a celebration when you get to spend the evening with DLM’s wine expert, Teresa Kearney, and Culinary Center Manager, Peggy Neary. 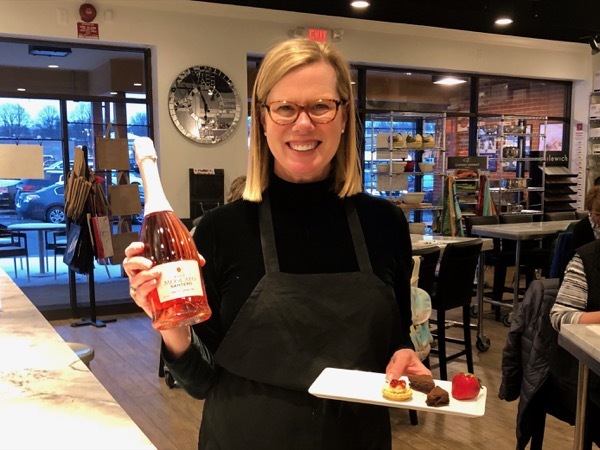 And a huge shout-out to Peggy Bishop, Kathy Kujawa, Donna Thompson and Rita Brown for making everything we prepared for this festive Girls’ Night Out look even easier! Awesome evening - you always make the best and easiest!